In 1924, the Dayton Air Service Committee acquired Tate Hill, as part of the 4,500 acres it donated to the U.S. Government for the creation of Wright Field. 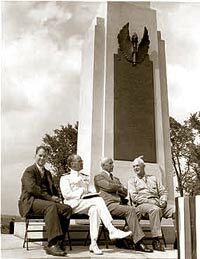 The hill was set aside for a memorial honoring the Wright Brothers. In 1974, the site was listed in the National Register of Historic Places due to several prehistoric Adena Indian mounds adjacent to the memorial. Bronze tablets commemorate the mounds, Wright Field's history, and list the students the brothers trained on the Huffman Prairie. The Miami Conservancy District transferred the park and memorial to the Air Force in 1978 as part of the 75th anniversary of powered flight. 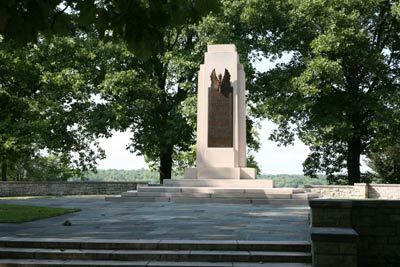 A display case near the stone wall overlooking Huffman Dam illustrates the history of Huffman Prairie and the Memorial. The Wright Brothers Memorial is open daily during daylight hours.